Sapphire Coast Buslines is a family-owned company whose mission is to provide safe, reliable, accessible and comfortable transport to the community, ensuring we are innovative leaders in bus, coach and travel. The owners of Sapphire Coast Buslines are Jamie and Anton Klemm. Deane’s Buslines South Coast was formerly Edwards Bus Service, established in Eden in 1924 by Richard Edwards. Jamie’s parents Dennis and Susan Deane purchased this in 2001 and renamed it Deane’s. In 2005 Jamie and husband Anton Klemm purchased Deane’s. They have three young children and are involved in and support a vast range of community and business activities, organisations, events and initiatives on the Sapphire Coast. 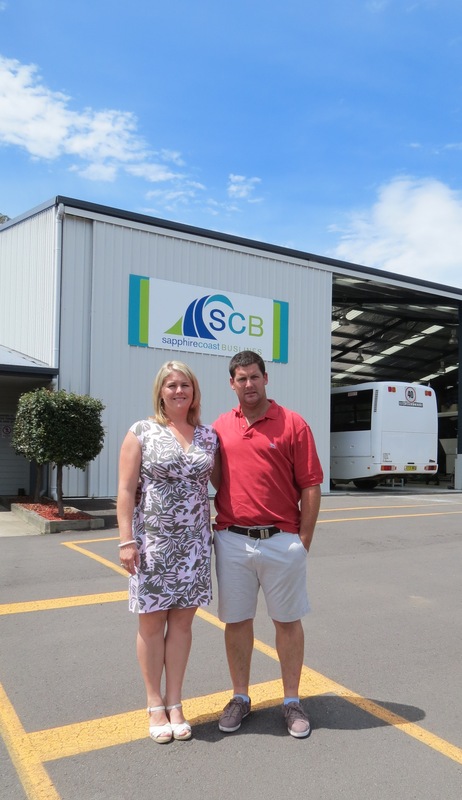 In 2013 Jamie and Anton renamed their business to Sapphire Coast Buslines, choosing the name to reiterate their firm commitment to the region. Each year Sapphire Coast Buslines transports more than 2400 school students to 14 schools in Eden, Bega, Wolumla, Pambula, Pambula Beach, Merimbula and Tathra. The business also runs an extensive route and demand-responsive timetabled service for the broader community.